A total of 11,000 American soldiers arrived almost overnight, building the 1,422-mile road across remote, unforgiving wilderness with up to 7,000 Canadian and First Nations guides and workers. Such was the urgency, construction began in March 1942 and the road opened on 20 November 1942, just eight-and-a-half months later. 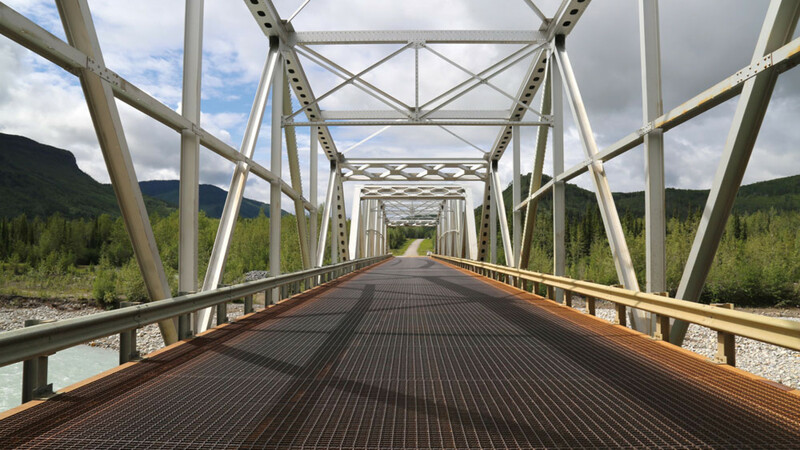 I drive out of Dawson Creek, sharing the highway – also known as the AlCan (Alaska Canada) Highway – not only with RVs, cars, cyclists and giant trucks, but also one man on foot, dragging a hefty trailer by hand, his dog bounding along beside him. Fir, pine and birch trees stretch mile after mile to the horizon, the same forests construction crews would have cut through – no mean feat. There’s a sense of humour in the ‘frontier’ country. A notice in a roadside café instructs travellers not to feed the Sasquatch (Bigfoot). Further along, a poster warns drivers to beware of hairy, 900-kilo ‘speed bumps’ on the road, also known as bison. I don’t spot any, but I do see three black bears meandering along the roadside. The drama of the Rocky Mountains’ landscape of granite peaks, racing rivers and endless forests ramps up a level as I drive through the second day. I stop for lunch at Toad River Lodge, looking up to see the café’s ‘world famous collection of hats’ nailed to the roof. “There were 10,180 at the last count,” the waitress tells me. 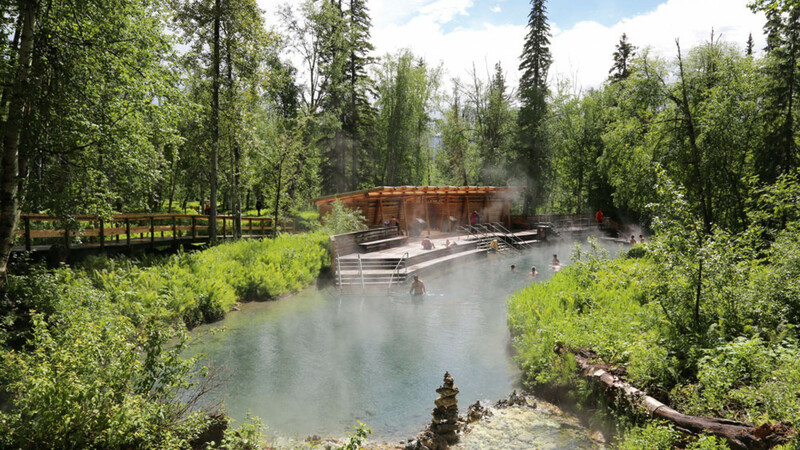 After a night on Muncho Lake, I drive on, stopping at Liard River Hotsprings for a soak in a natural geothermal pool, sulphurous-smelling steam rising off the hot water. I notice two black bears by the quiet roadside in the afternoon’s drive, the male attempting to get it on with an uninterested female mate. Then, shortly after passing a ‘Welcome to Yukon’ sign and crossing the state border, I’m greeted by a fat porcupine waddling across the road. Apart from the highway itself and the odd petrol station, there are few marks of civilisation on Yukon’s roads the next day. 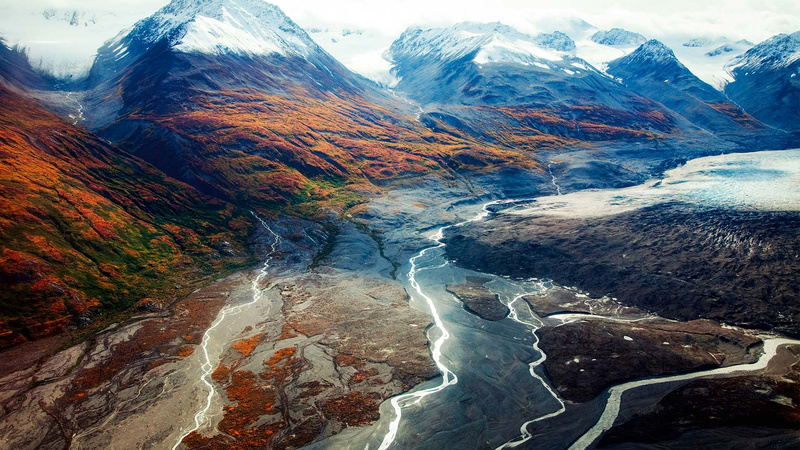 The land grows wilder, with fast-running rivers, deep-blue lakes and mountains, the road passing by dark pyramids, ridges and giant shark fins caked with snow. At Whitehorse, the Yukon’s state capital, I visit the Yukon Transportation Museum, where there’s a hangar filled with old bi-planes, police cars and Canadian military trucks used to maintain the Alaska Highway after the war. “Pretty much all the original road had to be rebuilt after the war,” says Murray Biggin, who works at the museum. “They had problems with ice and permafrost. A lot of it turned into bog.” Almost all the highway’s now tarmacked, with a few gravel sections. The road’s also much straighter now, which means it’s also shorter than it was. The original drive between Dawson Creek and Fairbanks was 1,523m. Today, it’s thought to be nearly 100 miles shorter, the historic mileposts now out of sync. We’re in bear country, Liddle pointing at scratched-up trees that bears have used as rubbing posts. The peak looming above us has a name, King’s Throne, but many don’t. 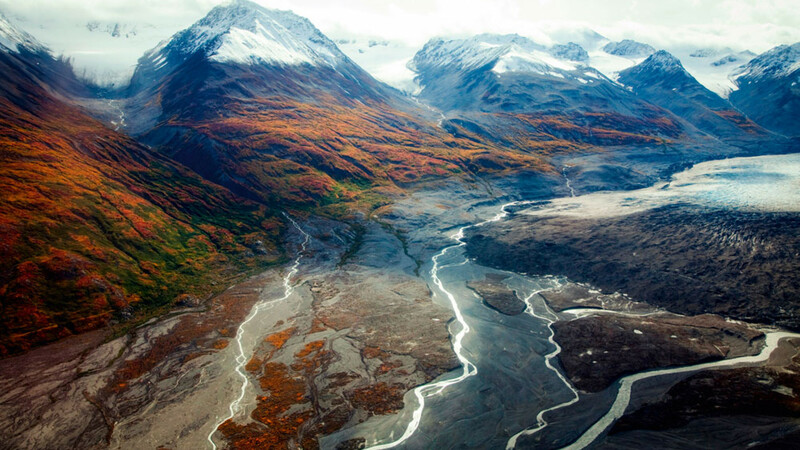 “There’s a land where the mountains are nameless, and the rivers all run God knows where…” Liddle recites, quoting from Robert Service’s poem The Spell Of The Yukon. I drive up Kluane Lake, the largest in the Yukon, in the afternoon and take a short hike up to Soldier’s Summit, where the highway’s opening ceremony took place on 20 November 1942 in temperatures of -30°F, with a dinner for dignitaries that included moose steak and champagne soup. Next morning, I cross from the Yukon into Alaska, the border between Canada and the United States marked with a dividing line of felled trees, American and Canadian flags flapping in the wind. Near-suicidal Arctic ground squirrels scurry across the highway. I stop at Tetlin National Wildlife Reserve, an important spot for migrating birds, with views across lakes and wetlands to the jagged line of the Wrangell-St Elias mountains on the horizon. Further down the road, I hike through spruce forest down to Hidden Lake, where a couple sit patiently, watching optimistically for signs of a moose. Clouds cast dramatic shadows over the Alaska mountain range as I set out next morning from the town of Tok. I cross the Gerstle River at mile 1,392 on the Black Veterans Memorial Bridge. One of the lesser-told aspects of the highway’s story is that 3,695 of the 10,607 US soldiers who built the highway were black, around 35%. Black soldiers often did the hardest jobs, were given the shoddiest gear, and were mistreated by officers. The highway couldn’t have been built without them. Delta Junction’s the official end, but the connected Richardson Highway, built before the Alaska Highway, continues on to Fairbanks. As I drive, I see a brown horse-sized shape by the roadside ahead, which turns out to be a female moose and her calf. Crossing the Tanana River, I drive by a section of the 800 mile-long Trans-Alaska Pipeline, then, approaching Fairbanks, a 25ft-high statue of Santa Claus. I stop in the city of North Pole, “where every day is Christmas” and street lamps are shaped like striped candy canes. They’re doing brisk business in the kitsch Santa Claus House, which feels surreal in June, filled with glittery decorations and gifts, many of them featuring moose and bears. A ho-ho-ho-ing Santa Claus sits travellers, young and old, on his knee. With the completion of my Alaska Highway road trip, the highway’s 75th birthday and now Christmas arriving early, it feels like there’s a lot to celebrate. Frontier Canada (frontier-canada.co.uk) offers tailor-made, 20-night Alaska Highway trips from £4,399 per person, including return flights from London to Vancouver (returning via Fairbanks, Alaska), car hire (including one-way drop-off fees) and 20 nights’ accommodation. Icefield Discovery Tours’ (icefielddiscovery.com) 1.5-hour flightseeing tour, including icefield landing, costs $325 CDN (£193). For more information, see Destination British Columbia (hellobc.com), Travel Yukon (travelyukon.com) and Travel Alaska (travelalaska.com).